The mallard duck (Anas platyrhynchos) is often one of the first birds a person learns to identify. I remember my mother taking me to Prospect Park to feed the ducks when I was a child. 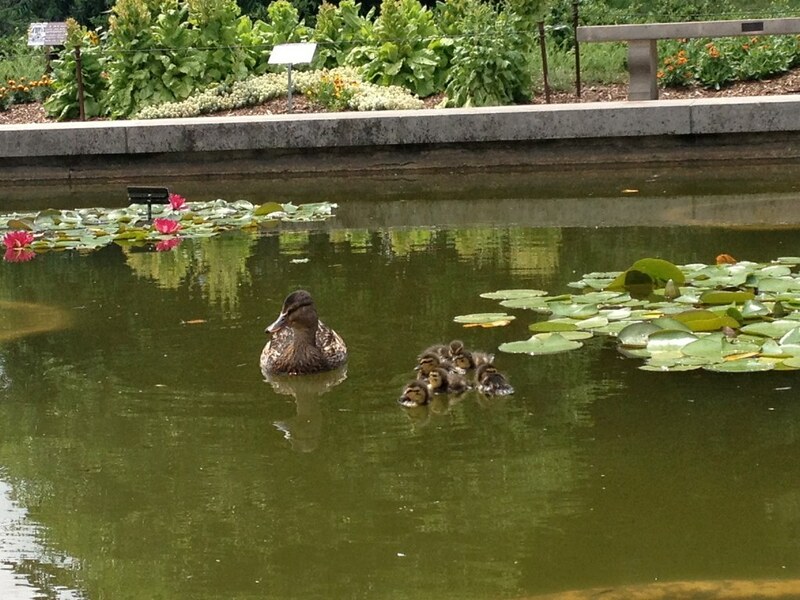 Sometimes we would also visit the ponds at Brooklyn Botanic Garden. She would get some old bread and bring it with us in case the birds were around. I noticed the ducks either had green heads or were all brown, and I remember learning that those with green heads were males and the brown ones were females—an early lesson in learning to differentiate birds. The mallard is the most common duck in the United States and has adapted well to living and nesting in developed areas. It's found across North America, Europe, Asia, and North Africa, and though it is a migratory species, it always seems to be present and very plentiful. It also mates readily with other species, especially the black duck, and produces all types of hybrids. The mallard is considered to be the ancestor of nearly all domestic duck breeds except for the Muscovy duck. Mallards prefer to nest near ponds or marshy areas, and they frequently do so at Brooklyn Botanic Garden. The nesting process actually begins in the fall, when courtship displays begin. Courtship continues through the winter and ends in spring, when the female lays between 5 and 14 eggs. She incubates them alone and also raises the ducklings by herself. At this time, males form “bachelor” groups and just hang out. Once the breeding season is over, both males and females molt their flight feathers and enter the “eclipse” stage, which lasts three to four weeks. During this time, both the males and females, which look alike at this point, usually try to stay hidden since they cannot fly and are very susceptible to predation. Mallards are dabbling ducks. That is, rather than diving for food, they feed by flipping their tail up and sticking their heads underwater. They rely on a variety of food, including water insects, dragonflies, snails, and aquatic vegetation—their diverse diet is one of the keys to their success. Though mallards can find food for themselves pretty easily, the bread that people feel compelled to offer them doesn’t seem to have a detrimental effect. It’s a good thing, since even with all the Please Do Not Feed the Ducks signs in parks, when people hear that “quack, quack,” they assume the ducks must be hungry and come flocking to feed them. This relationship has made mallards not just plentiful but beloved as well. 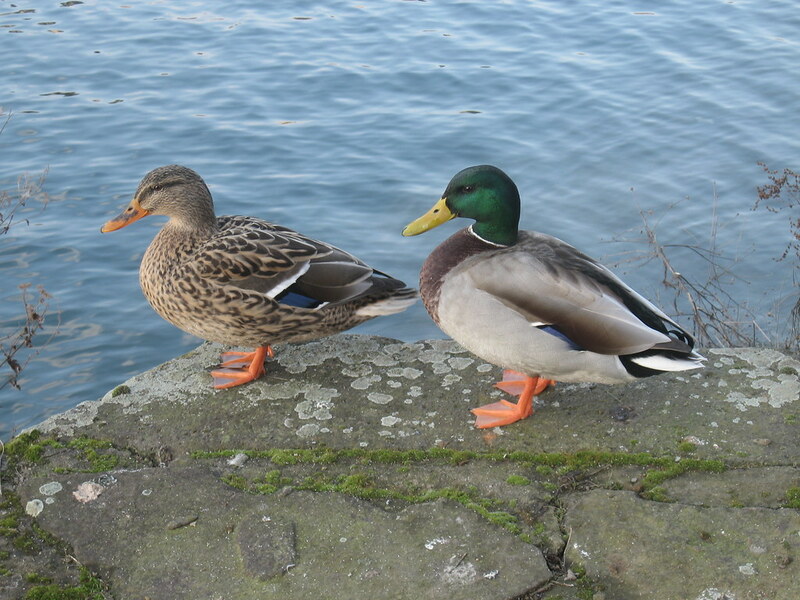 A pair of mallards (Anas platyrhynchos). Photo by Mbdortmund. 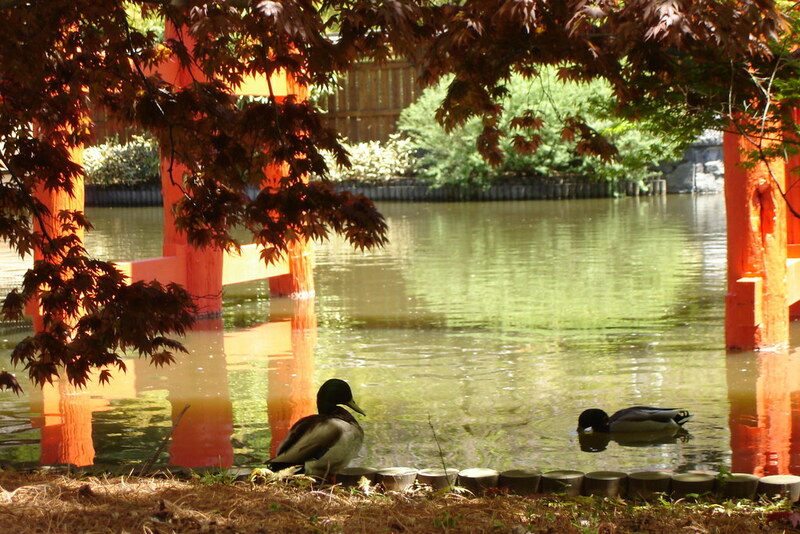 Mallards love Brooklyn Botanic Garden's water features, including the pond in the Japanese Hill-and-Pond Garden. Photo by Dave Allen. 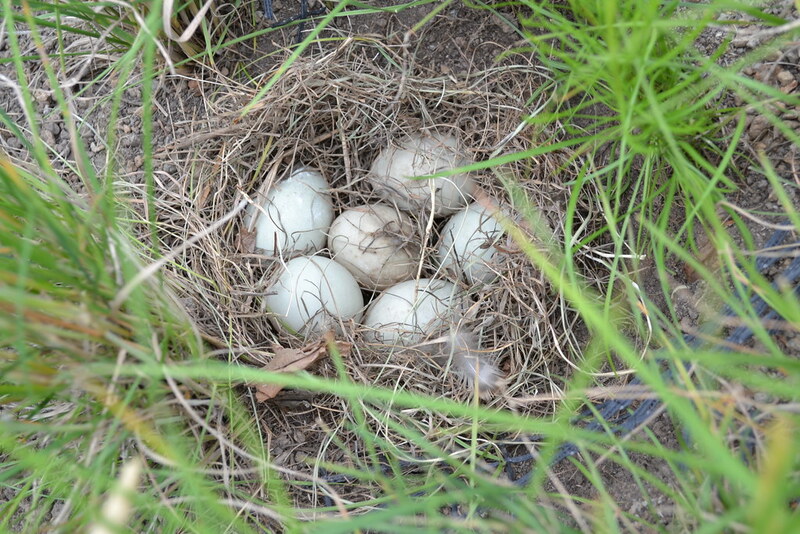 A clutch of duck eggs on the green roof of BBG's Visitor Center. Photo by Barry Rogers. 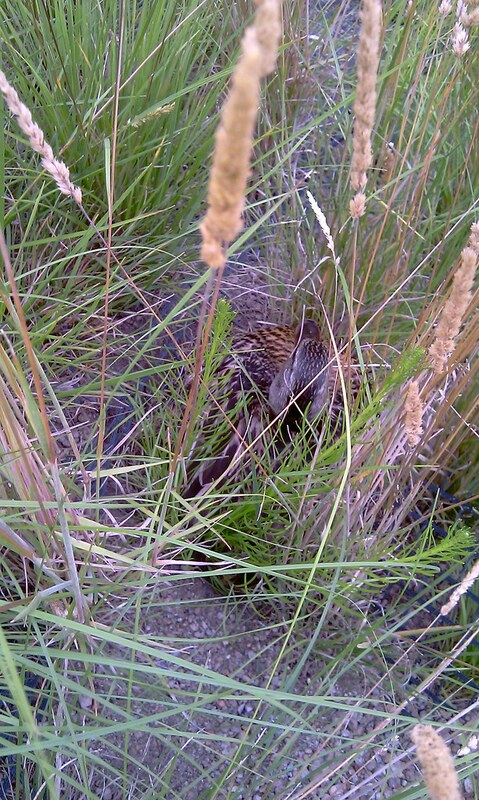 A mother duck sitting on her eggs on the Visitor Center's green roof. Photo by Barry Rogers. A family of ducks investigates one of the lily pools. Photo by Sarah Schmidt. 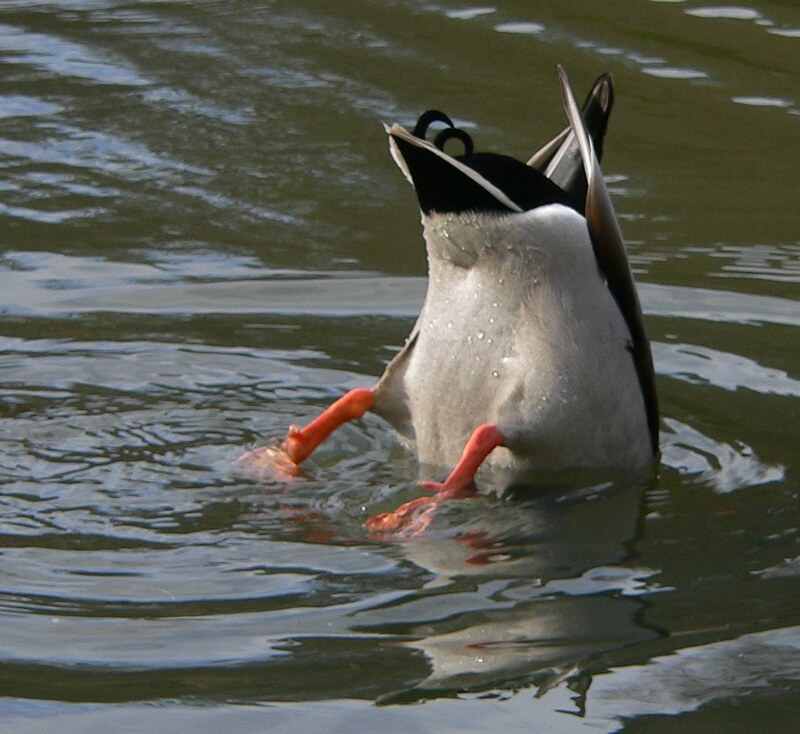 Mallards don't dive underwater, but they go bottoms up, or dabble, to catch food. Photo by Ulrich Prokop.